It's probably no surprise to anyone that my idea of a fun date is probably different from just about everyone else's. 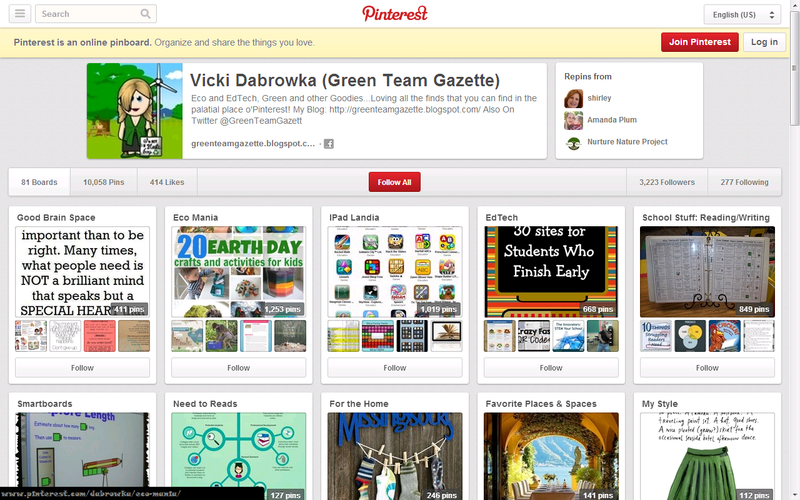 This, of course, goes without saying on the mere fact alone that I write an eco-blog for kicks. Well, about 2 weeks ago, I got to go on a great date with my husband during his work day. As a logistical manager for a global telecommunications company, Mr. D. deals with a lot of vendors in the shipping industry. Just a hop, skip, and a jump from his office, is one such vendor: Priority Worldwide Services (http://www.priorityworldwide.com/). They invited Mr. D. to come take a peek at their Hanover, Maryland facility, which just so happens to be a LEED certified platinum building [which, in layman's speak, is "Eco-Green" to the Nth degree, certified by the US Green Building Council]. When asked if I wanted to tag along, I said, "You betcha!" It was love from the instant we entered Priority Worldwide Services' (PWS) foyer. The waiting ﻿ ﻿room foyer has a collection of repurposed stadium seating from 1920s & 1930s stadiums [namely from the Detroit Tigers and the Montreal Forum]. In doing this, PWS has kept potential landfill-fodder from filling those landfills! As with every other eco-element in the PWS building, nearby there is an informative sign detailing the rhyme and reason as to why it was chosen and how it aligns with their vision of environmentalism and sustainability. An educator's dream! This is just the first hint that Priority Worldwide Services certainly does have their priorities straight! ﻿99% of the furniture in-house came from a reused source or has been salvaged. The wall paint has Zero VOCs (Volatile Organic Compounds--by using this kind of paint and sealants, there's no off-gassing or "post-paint smells"--meaning a non-toxic, healthier environmnet). Bamboo flooring (a renewable material) brightens the break room. The majority of the flooring in the facility is stained concrete (again, zero VOC). There are carpet-square tiles in some areas, which will make for easy spot-replacement when needed (rather than full-flooring replacement, which reduces waste). Also, several office rugs were made from recycled soda bottles and tape measures. 80% of the ceiling tiles are recycled, while 96% of the drywall comes from recycled content. Countertops and desktops are made from compacted seed, paperstone (recycled office paper) or bamboo, depending on where they are placed and how they are used. Motion-sensored lights fill the building. Some of the desk supports were fashioned out of airplane elements. 500+ solar panels are on top of PWS's facility, which supplies about 95% of their in-house power; the remaining ﻿ ﻿5% of their energy is from 100% Green E certified sources (aka, wind and solar). ﻿A "white roof" is in place to help reflect sunlight off of the building, which also helps to cool it more than a traditional dark-colored roof. 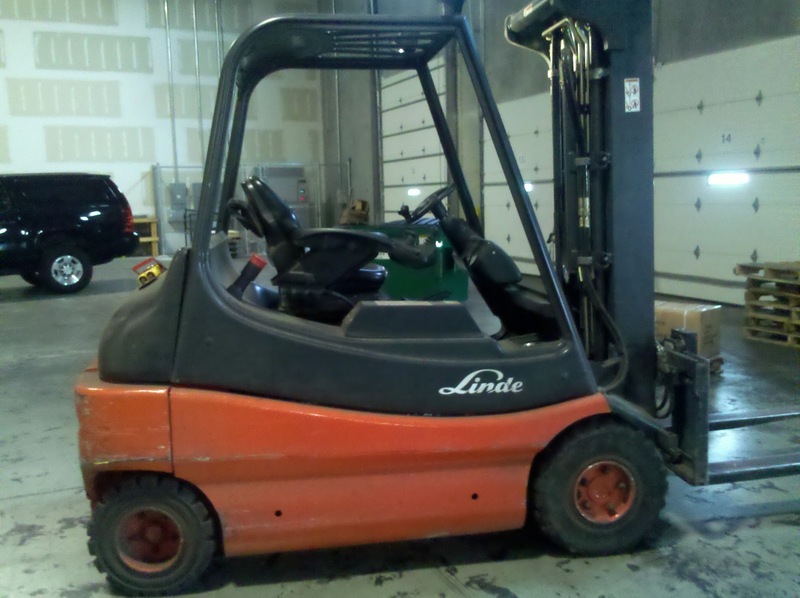 When replacements are needed in the warehouse, PWS is bringing in electric forklifts versus propane ones. This not only is more energy efficient, but cleaner as they produce no silt. When "disposables" are needed in the break room, potato-based and corn-based cups and utensils are the chosen ones...although reuseable alternatives are always their preference. Their shipping trucks are on a 3-year rotation to ensure the lowest emission vehicles possible as they bring new ones in. (At this point, hybrids still are not the best economic option). Their cleaning crews utilize environmentally-friendly methods. I seriously think I could go on and on!! yes, it's an airplane wing! ﻿﻿﻿Two of the very coolest of all finds were in two of the most opposite places. One was in the ﻿conference room. 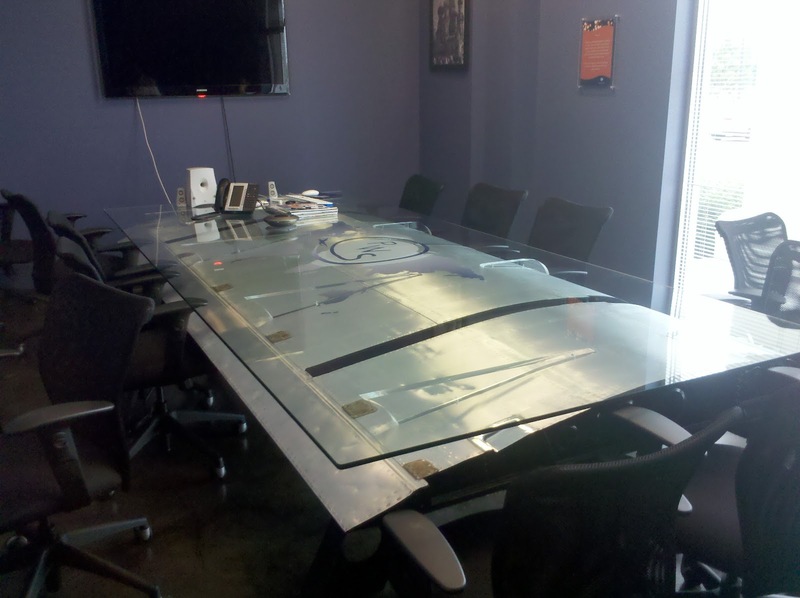 What once was a C-130 airplane wing is now a glass-topped conference table! As a company that moves items from one place in the world to another, how perfect is this?! The second extraordinarily neat thing was in the warehouse. 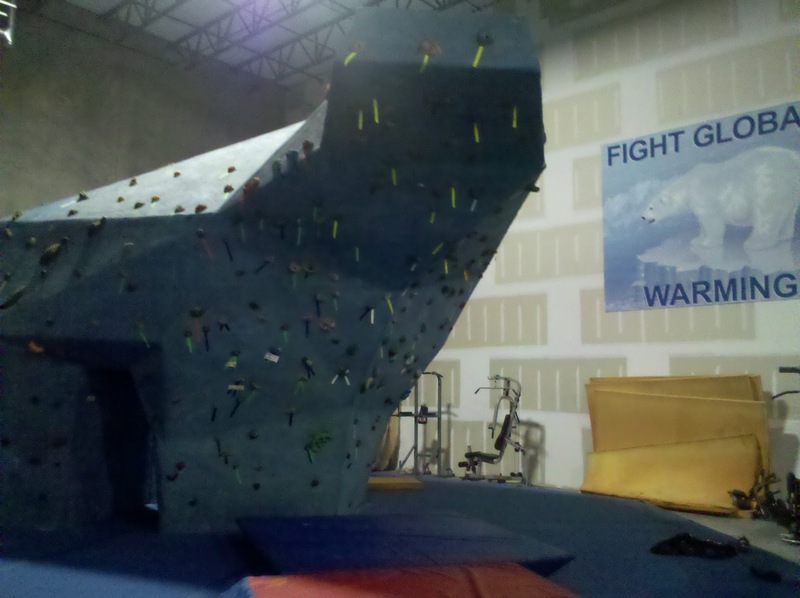 One corner was used to house a "polar bear"-shaped rock wall. Symbolically perfect, the rock wall encapsulates the importance of environmentalism. The polar bear standing on the lone ice cap is the iconic image of climate change/global warming, rendering its message: "This is what we will face if we don't hurry up and solve our global, environmental problem." the polar bear shaped rock wall! ﻿﻿﻿﻿﻿﻿﻿﻿﻿﻿﻿What I also like about the rock wall is that it takes the idea of the outdoors and brings it into the workplace. 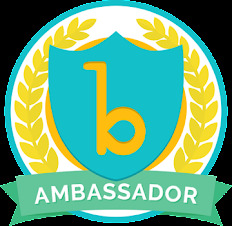 As we become a country of more and more computer-based, sedentary people, here is an on-the-job invitation to take a break and use it wisely. Activate those muscles. Get moving. Sometimes the best brain-break is one where you shake it all up, then come back to see things more clearly. If climbing a bear of a rock doesn't do it, I don't know what will! Yes, Priority Worldwide Services definitely has their priorities straight...and hopefully will stand out as a striking example to other companies that yes, it is possible to be a vital, vibrant, successful, SUSTAINABLE, and globally active business. 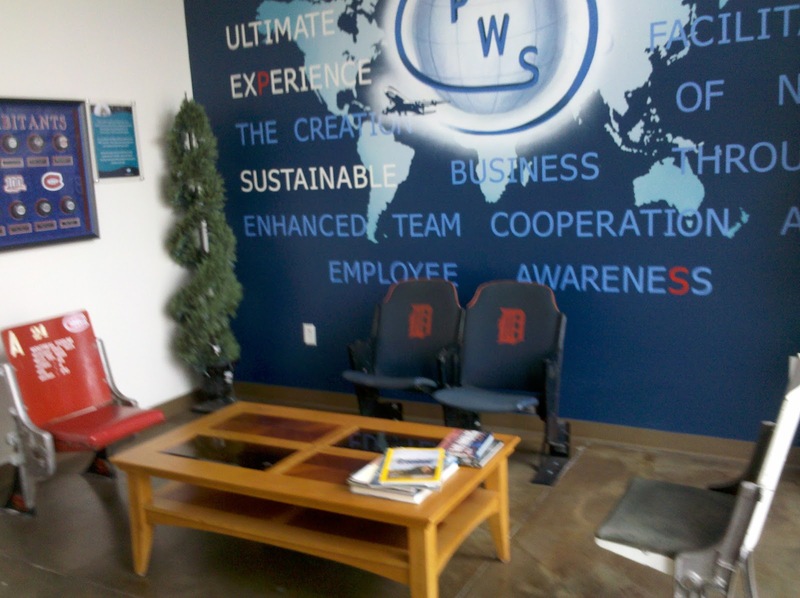 To get a true picture of PWS's dedication to sustainability, check out their "green guide" that highlights their 5 facets of environmental dedication [Site Sustainability, Water Efficiency, Energy & Atmosphere, Materials & Resources, & Indoor Environmental Quality]: http://www.priorityworldwide.com/about_pws/environment_corporate.aspx. Special thanks to Marc Tohir and Miguel Patino and the many others at Priority Worldwide Services who let me tag along and see all the sustainable sites! Images of Priority Worldwide Services from my May 23rd, 2011 visit to their Hanover, Maryland facility.